June 29 & 30, 2013 AAU Regional Qualifier Junior Olympics Chantel finished 3rd in discus 53'5" with a personal best. She finished 3rd in Javelin with her first attempt throwing the Javelin.Chantel finished 6th in shot put with a new personal best of 19' 4 3/4. USATF Regionals Junior Olympics Chantel 13 in shot put with a personal best of 21'5 1/4 and finished 8th in discus with a 48'1" . June 15, 2013 Chantel finished 5th in shot put and got a personal best in discus with a 49'4" finishing 2nd. AAU June 1 & 2 meet at Ansin. 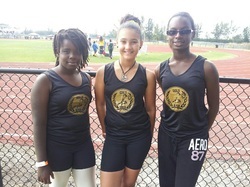 Chantel competes in her first meet with Gold Rush on Saturday at the Pal of Hallandale meet. Chantel finished 2nd in discus with a 40'10" throw. Congratulations to Chantel. Chantel threw a 15'7" in shot today at the Miramar Optimist meet. She was unable to compete in discus when the meet was rained out. May 25, 2013 Memorial Day Meet @ Ansin Chantel finished 2nd in shot put today with a 16'3". Good job Chantel. Keep up the hard work. Chantel got a personal best in shot put of 17'10 and finished 4th. Looking forward to seeing her compete in the next meet.